Dementia encompasses many, usually progressive, brain disorders that lead to a loss of brain function. 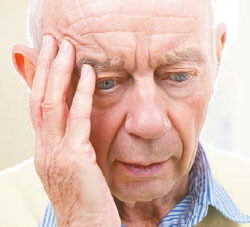 Dementia encompasses many, usually progressive, brain disorders that lead to a loss of brain function. There are around 850,000 people with dementia in the UK, and this is expected to rise to more than one million by 2025. One in six people aged over 80 has dementia. Frailty is a state of increased vulnerability, according to the British Geriatrics Society (BGS). It results from ageing associated with a decrease in the body’s physical and psychological reserves, and leaves people at risk of rapid decline in physical and mental wellbeing. The National Institute for Health and Care Excellence (NICE) says people should be encouraged to stop smoking, be more physically active, reduce alcohol consumption and adopt a healthy diet to help lower the risk of developing dementia, disability and frailty in later life. Physical decline is not an inevitable part of ageing and lifestyle changes in mid-life can bring real benefits by delaying or preventing the development of these conditions. NICE recommends commissioners, managers and public health professionals develop and support population-level initiatives to reduce the risk factors. Early signs of dementia can include lapses in memory and problems finding the right words. The Alzheimer’s Society says other symptoms may include mood changes and communication problems, such as a decline in the ability to talk, read and write. Falls, immobility, delirium, incontinence and susceptibility to medication side effects can suggest frailty, according to the BGS. A person’s risk of dementia, disability or frailty is sometimes determined by factors that cannot be changed, such as inherited conditions, age or injury. But NICE says some changeable lifestyle factors, such as smoking, lack of physical activity, alcohol consumption, poor diet and being overweight, all increase risk. Nurses can use motivational interviewing techniques to support lifestyle changes in patients. Motivational interviewing is a form of counselling that recognises it is the individual’s reasons for change, not those of the practitioner, that elicit a change in behaviour. Nurses should empower the individual. Talking about change, rather than lecturing or telling patients to change, leads to more successful outcomes, the RCN says. Begin by asking patients questions that make them consider their behaviour, such as ‘What would you like to be different about your current situation?’, and ‘What makes you think you need to change?’. ‘Nurses need support to give behaviour change messages in all health areas, whether on reducing obesity or smoking, reducing dementia risk factors, taking up exercise or ensuring people take their medication. People need to be made aware of the effects of unhealthy lifestyles, but we do not want a blame culture.